Offering a completely furnished studio apartment with a balcony for rent in Prague. 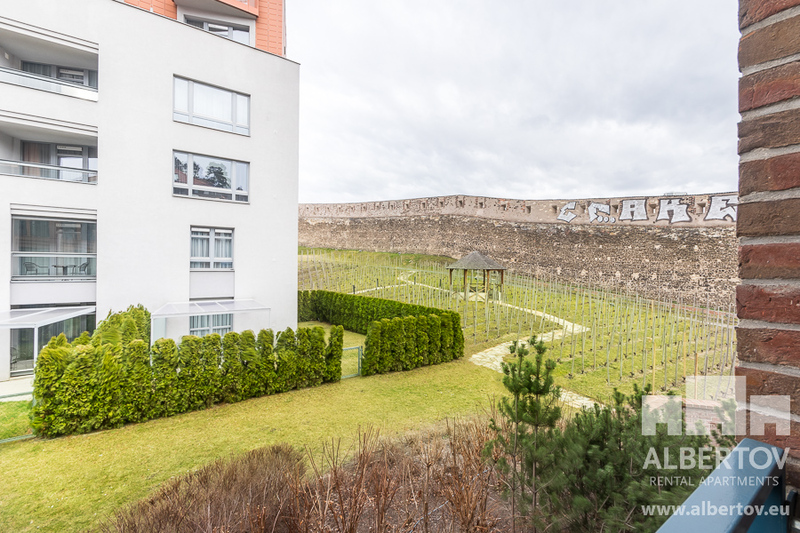 A spacious and modern apartment with a balcony, on the second floor, is found in a calm, closed area of Albertov Rental Apartments in Prague 2, not far away from the center of Prague. Albertov Rental Apartments gives you more comfort and privacy than whatever kind of a hotel in Prague. The interior of this apartment is furnished with modern furniture, comfortable living room seating, wooden floors with heating and also huge windows which fill the room up with light during the day. For more room in the apartment we place a pull out bed in there with a comfortable anatomical mattress. The LED dimmer lights are in the whole apartment which add a nice atmosphere. 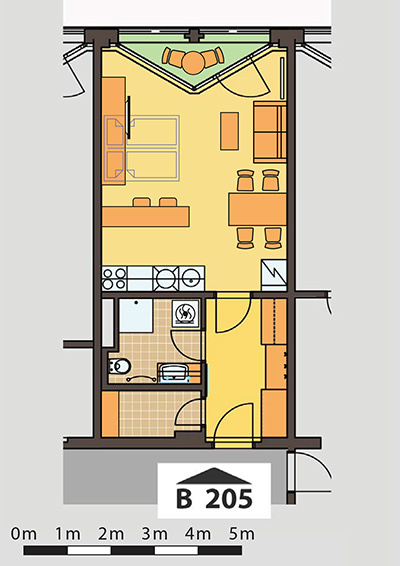 This apartment will let you have a nice entrance into the balcony with seating and a nice view into the area. Satellite television with Czech and international programs, fast working Wi-Fi network is customary. The kitchen is separated from the living room by the bar with LED lighting and a wine cooler. For easier cooking in the kitchen we completely equipped the kitchen and it has modern appliances: electronic stove, microwave, dishwasher, cooker hood, glass ceramic disk for cooking and a refrigerator with a built in freezer. The spacious bathroom is made for your comfort and relaxing, made with floor heating, a shower, sink with LED lighting, a washing machine and a separate dryer on top of the washing machine. If you are in need of more space the hallway has more closets plus the storeroom. If by any chance you are driving we have a garage where you can park. After parking, as you get out of the car you will be able to take the elevator up to your apartment. You also have shopping choices as you step of the building. Like the pharmacy, (highly chosen by locals) restaurant in the area, Potrefená Husa and a grocery store, Lidl.